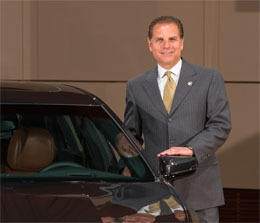 In addition to his GM position, Dave Leone is the Cadillac Brand Lead Executive Chief Engineer, a position created to drive brand focus through product content, design, engineering as well as commercialization. In these recently created roles, Leone leads a team of chief engineers who oversee the development of performance luxury vehicles from inception to launch. Leone has been the leading force behind such vehicles as 2013’s North American Car of the Year, the Cadillac ATS; the all-new 2014 Cadillac CTS; and the Chevrolet Camaro Z/28 and Chevrolet SS. Leone reports to Doug Parks, GM Vice President, Global Product Programs. Prior, Leone was the Global Vehicle Line Executive and Global Vehicle Chief Engineer, RWD and Performance Vehicles. In that position, he received many awards for the 2008 CTS, including Motor Trend Car of the Year, a spot on Car and Driver’s 10 Best and a Consumer Reports Recommended Buy. He also held the positions of Vehicle Chief Engineer, XLR and Director of Interiors. Leone has had extensive experience within GM engineering, having also worked with the ride & handling development team, and the validation-testing and chassis groups, among others. He began his career with GM in 1979. Leone holds a BS in Mechanical Engineering from Oakland University and an MBA from Wayne State University. He serves on the Board of Advisors for Wayne State’s Business School and is a member of the Society of Automotive Engineers.